Are you a crypto enthusiast, an airdrop lover trade.io in partnership with kratos is ready to set a pace in the world of crypto ecosystem by giving out a whopping amount of 1 million KTOS tokens to be won by users. Trade.io is a crypto base exchange platform that enables users to trade bitcoin and other alt coin on their exchange with seamless transactions. Trade.io is here to help solve and build a better fast, reliable cryptoexchange support team. Enjoy unlimited free deposit and minimum fee for every withdrawal all with trade.io. World's 1st Blockchain & Cloud-Based hybrid ERP for physical commodities trading & trade finance. Commodity trading challenges include insufficient trust, manual documentation, and unnecessary intermediaries. These problems often result in significant time-delays and high costs. KRATOS™ is an Ethereum-based platform that employs Blockchain Technology and Smart Contracts to address these challenges. As a result, the KRATOS™ platform delivers transparency, higher efficiency, and less complexity than any other existing system. The use of this platform would result in more timely deliveries and lower Costs. source. This is really an amazing offer to all cryto lovers to get some ktos toke for free. It is simple and easy. Below are the three steps to be in other to be qualified as a participant. Open an account on trade.io. If you want to qualify for the airdrop, you should open an account before 3PM GMT on Tuesday, 22nd January. If you have an existing account on trade.io, don't create a new one - you're already eligible! On Wednesday 23rd January, you will be airdropped 75 KTOS tokens to your account. KTOS will also be listed on this day, so you can purchase more tokens to compete with! Check your position from the leaderboard on this page. We'll be updating positions and volumes once a day. All the above steps are to be taken strictly in other to be opportune in becoming one of the beneficiary of the airdrop. Note: Trader with the highest volume of ktos win more token directly to their wallet. Total value of airdropped coins is $297,000! What are you waiting for, go get your wallet prepared in anticipation for token distribution. 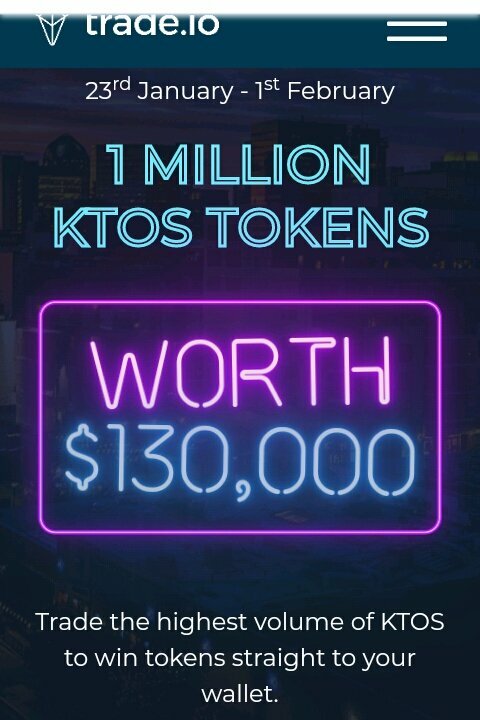 Start trading and you can be the lucky winner of 200,000 ktos token. √ in view of the ongoing competition, airdropping a total of 2,225,000 KTOS to three (3) groups as listed above. √ Distribution of 1,000,000 ktos liquidity pool to all participants. What are you waiting for, get your account ready and activited now. Snapshots are being taken at 3PM GMT on Tuesday, January 22nd. Follow trade.oi on other social media platform like facebook, telegram, twitter etc. kindly watch the You tube video clip for more info. Disclaimer: The content shown above is not financial advice and users should do well to do their own research before investing in cryptocurrencies or any digital asset. This blog post was made for entertainment and knowledge purpose only.